Playoff basketball is what every ball player lives for. It’s that time to kick it into the next gear and play like you never have before; the adrenaline rushing through you is like none other. Not everyone experiences this feeling. The fight for this feeling is in every basketball player, but it takes a team’s collective effort and fight to get there. In high school, the gravity of a playoff game was one thing. I had spent three and four years with most of my teammates and we knew how to get there with the chemistry we built. But in college the atmosphere really changed. The thought of opposing coaches scouting you in-depth, the people watching, and the overall competition made the playoff experience so different. It brought me out of my basketball comfort zone. In two years and two playoff games here at City College, I’ve never been up so high and down so low all throughout the course of one game-day. Freshman year was a roller coaster ride. In your first year of college basketball, it’s tough to know what to expect. I had my moments. My career highs, my highlights, my mistakes: all part of me growing as a player. And going to the playoffs in my first year of college basketball meant something to me. I had the mentality that a statement had to be made even if no one else did. Unfortunately, we ended up losing; I had seven points in five minutes. Pretty good, you might say, for a freshman. But I’m never satisfied — I’ll take a win and a bad performance over a loss and a good performance any day. If freshman year was a roller coaster, then sophomore year was The Kingda Ka. More ups, more downs, more playing time, but still I wasn’t satisfied, not just with myself, but with our team. This team was much different from last year’s team in the sense that I genuinely felt we could win games, but not with one guy scoring 30 every night. We needed that team basketball chemistry, the kind I had back in high school. I knew when we played like that we were so difficult to stop. We had countless weapons. When our team play got us into the playoffs, I took a different approach to this year’s game. I knew what the atmosphere would be like, so instead of trying over-amp myself, I played the cool guy, the “I’ve been here before” guy. I took two hot baths the day before the game to rest my muscles. I ate well, and I walked into the gym that day with a willful scowl, avoiding any signs of weakness. I was throwing down dunks in warmups before the refs came. I was hoping some of that energy would rub off on everyone else. The game started off well, but we couldn’t stop them in the second half. Something didn’t carry over from that first half, and it became painful to watch. What I realized after the game is that it was most of my teammates’ first playoff game, and I wasn’t sure how they went about preparing for it or how they nervous were. That’s no excuse to attribute this year’s loss to, though. I played worse this season than I did last season, including the lone playoff game: I had zero points and a turnover. I cared about that, yeah, but I worried more about why we stopped playing like a team and let it get away that game. After two identical seasons, unfulfilled expectations (from myself and my peers), and disappointment, it’s hard to say how I feel moving toward my junior season. One thing is for sure, I am taking a different approach to this offseason. I can’t have the same offseason as last year, as productive as it was. After all, they say attempting the same thing and repeatedly getting the same result is defined as insanity. I can only hope my fellow teammates, the coaching staff, and athletics’ department take different steps toward bettering our program as well. For this team to get better, it’s going to have to be a collective effort. What I learned after two one-and-done playoff years is that as a team, our determination and work ethic needs to match our expectations. We can’t be bitching about suicides in practice and expect to pass the first round of CUNY playoffs. We can’t be joking in film sessions expecting to win the CUNYAC. Winning games requires a winning attitude, and it’s a business attitude. Involvement in NCAA Athletics is a job in itself. You come to the office, you put in the work, and you go home and prepare for another day of work. It’s not illegal to have fun every once and a while, but halfway through my college career, I’m willing to sacrifice some laughs for some serious, beat-each-other-up practices if it means not flopping in the playoffs again. A practice lacking intensity the day before a game leads to a dull performance the following day. If we didn’t scout players properly, or waltzed into a game expecting an easy win, we were guaranteed a loss. I am sure things will change next year, simply because I believe everyone is just as sick of this trend as I am. As one of the only teams who play on our large neo-gothic campus in one of the nicer gyms in the CUNYAC, we owe it to ourselves and the student body to host competitive games, and maintain a solid record. Since this school dropped to Division III after the 1950 scandal, it’s been hard to redeem CCNY’s basketball legitimacy. It all starts with our mindset. A winning mindset will translate into team-oriented basketball on the court. We know that because we’ve won games that way, and have been buried by teams who play as a unit as well. 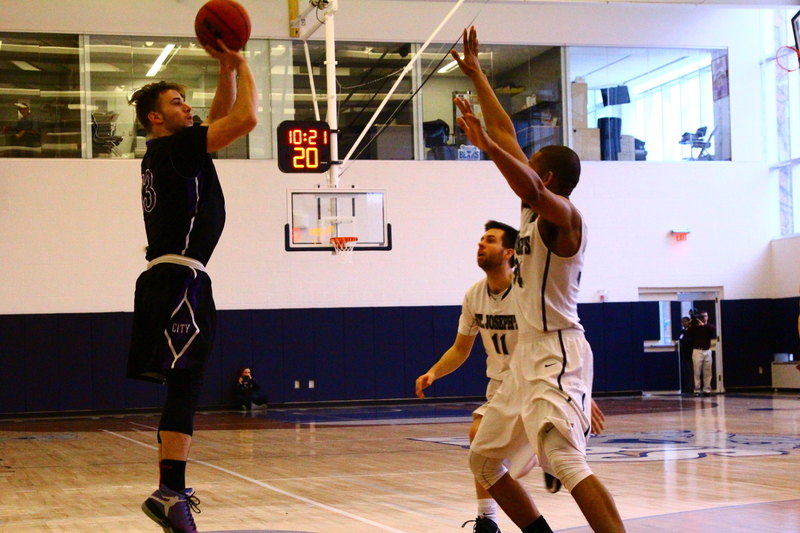 CCNY basketball has had the coaching experience surrounding the program to make it successful. It now needs a unit to UNITE and TRUST in one another before we return to greatness.